As an inflatable manufacturer company that has been in business for almost 10 years, we come across many inflatable rental companies. Companies that come to us to purchase their units know that we provide high quality products that come with warranties. One of the most common questions we get asked from start-up inflatable rental companies is what inflatable to buy first. 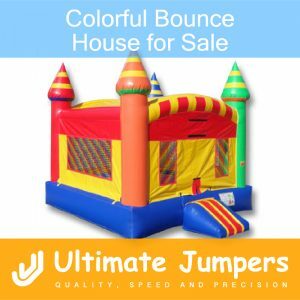 From experience, we can safely say that a colorful bounce house for sale is the best investment for the rental companies. There are many different types of bounce houses on the market today, but not all of them are created equal. For example, we have seen a few inflatables that have dull, minimal color combinations. These types of inflatables are not really suited for kids because they don’t provide a bright, fun atmosphere for jumping and sliding. In addition, research shows that bright, vivid colors excite kids and their imaginations. Why not incorporate these facts into the inflatable rental business? A colorful bounce house for sale is the best way to start up a fleet of inflatables for a rental company. This is because colorful bounce house is versatile for many different types of parties and themes. In addition, it is the most popular type of inflatable in terms of what gets rented the most. Bounce houses are simply incredibly fun because kids can jump, roll, laugh, and play in the units.